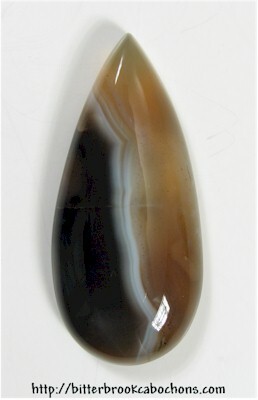 Meet cabochon BDA003, or "Big d... agate," as I nicknamed it. It's large and thick, and would look great in a BD Silver pendant. There's a BD fracture across the middle that stops halfway through; I tried my best to break the cab, but the fracture appears stable. 57mm x 26mm x 9.5mm. Weight: 105.25 carats.